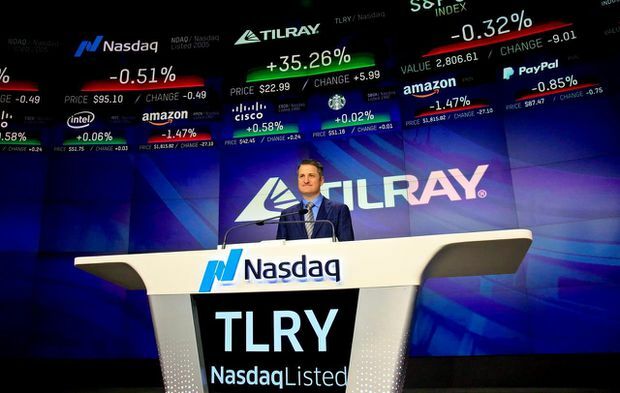 Tilray founder and CEO Brendan Kennedy poses for a photo before closing the Nasdaq in New York on July 19, 2018, after his company's U.S. IPO. Cannabis producer Tilray Inc. reported its fourth-quarter revenue surged by more than 200 per cent year-over-year to US$15.5-million, but its net loss for the period also deepened. The Nanaimo, B.C.-based company said its net loss for the quarter ended Dec. 31, 2018 amounted to US$31 million or 33 US cents a share, compared with a net loss of US$3-million or four US cents a share a year earlier. Analysts had estimated quarterly revenues of US$14.15-million and a net loss of US$10.43-million or 12 US cents a share, according to those surveyed by Thomson Reuters Eikon. Tilray said that the increased net loss for the quarter was primarily due to the increase in operating expenses owing to growth initiatives, expansion of international teams and costs related to financing and merger and acquisition activities. For the full 2018 financial year, Tilray reported revenue of US$43-million, up 110 per cent from the previous year, and net loss of US$67.7-million compared with US$7.8 million in 2017.